Did Satan Appear Unto Eve As A Snake, Or In The Form of A Man? This is a question which is unique to Latter-day Saints, and that is because of the temple endowment. While it is not appropriate to discuss the endowment in detail here, suffice it to say that throughout the instruction that accompanies the rituals, it is necessary to have an actor represent Satan as the adversary. This is especially true when the endowment was first administered in this dispensation through Joseph Smith. There were no movie special effects in those days, yet roles of characters needed to be assumed, and someone needed to play the part of Satan. And so the endowment as we have it incorporates a human representative for Satan. The account in Moses, which is the inspired revision of the account in Genesis, gives a very interesting detail: “Satan put it into the heart of the serpent, (for he had drawn away many after him,) and he sought also to beguile Eve… (And he spake by the mouth of the serpent)” (Moses 4:6-7). 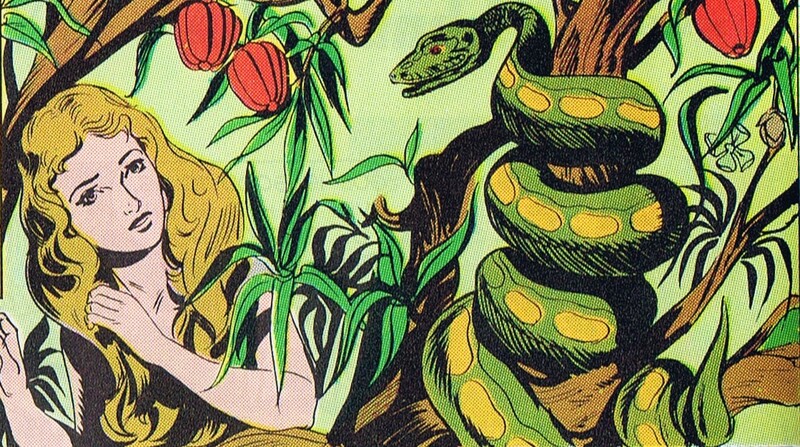 This suggests that Satan had some sort of influence upon an actual snake in the Garden of Eden. And that through this actual, literal snake Satan spoke to Eve. The fact that Satan possessed the body of a snake to beguile our first parents is what gave him forever after the title, “that old serpent.” Bruce R. McConkie taught this when he wrote, “Since the day in which Satan spoke by the mouth of the serpent to entice Eve to partake of the forbidden fruit (Moses 4:5-21), Satan has been called ‘that old serpent.’ (Rev. 12:9; 20:2; D. & C. 76:28; 88:110.) Choice of the name is excellent, indicating as it does a cunning, sly, subtle, and deceitful craftiness.” (Mormon Doctrine, 2d ed., p. 704.) No doubt the stealth and slyness of the serpent suited Satan’s demeanor, and so he chose to take its form as he attempted to bring ruination to Adam and Eve. To say that Satan did not actually take the form of a snake destroys much of the meaning of many phrases in the Garden of Eden story. Certainly the rebuke God gave the serpent (Satan) was intended for the devil and not just snakes. But it was given in the context of a serpent, comparing Satan to the reptile in whose body he entered. For instance, “thou shalt be cursed above all cattle, and above every beast of the field; upon thy belly shalt thou go, and dust shalt thou eat all the days of thy life” (Moses 4:20) and “he [the seed of Eve] shall bruise thy [the serpent’s] head, and thou [the serpent] shalt bruise his [mankind’s] heel” (Moses 4:21). This means, no doubt, that Satan and his minions will have power to afflict man in diverse ways, but unto mankind will be given a Savior to overcome Satan. Also, the woman confessed to God that, “the serpent beguiled me” (Moses 4:19). This utterance would have made no sense if a snake had nothing to do with her conversation with Satan. Therefore, from this reasoning and the plain statements in Moses chapter 4, we can be sure that Satan used the medium of a literal snake to converse with Eve. I have heard ministers of the gospel declare that they believed every word in the Bible was the word of God. I have said to them “you believe more than I do.” I believe the words of God are there; I believe the words of the devil are there; I believe that the words of men and the words of angels are there; and that is not all,—I believe that the words of a dumb brute are there. I recollect one of the prophets riding, and prophesying against Israel, and the animal he rode rebuked his madness. (Millet & Jackson, eds., Studies in Scripture, Vol. 2: The Pearl of Great Price, p. 92. Emphasis in original). A sample image from some of the Joseph Smith Egyptian Papyri. Displayed here is a snake with legs similar to that described by Josiah Quincy. Secondhand accounts of Joseph’s sayings from people who were not close to him should always be approached with a healthy caution as to their veracity. But while this is a bizarre teaching to this author, if Joseph Smith did in reality teach it, then it is accepted as being true without reservation. And with no compelling reason to doubt the Josiah Quincy account, it seems there is little alternative. Also, Hyrum L. Andrus noted that William W. Phelps wrote in the Times & Seasons that, “the serpent was cursed to crawl upon his belly through the loss of his feet.” (as quoted in God, Man, and the Universe, p. 372. Emphasis added). However, if this <?xml:namespace prefix = st1 ns = "urn:schemas-microsoft-com:office:smarttags" />Quincy account about snakes having legs is true then this is further evidence that Satan literally came in the very body of a snake. Satan, “that old serpent, who is the devil” (2 Ne. 2:18) is thus called because he literally inhabited the body of a serpent while in the Garden of Eden. This act, symbolic of his cunning, has come to be archetypal of his subsequent devices among men. The fact that his diabolical possession of the serpent was a real and literal event serves to increase the meaning of the symbolism between Satan and the serpent. And this gives us a clearer picture of what went on in the Garden of Eden when our first parents were cast out of paradise.